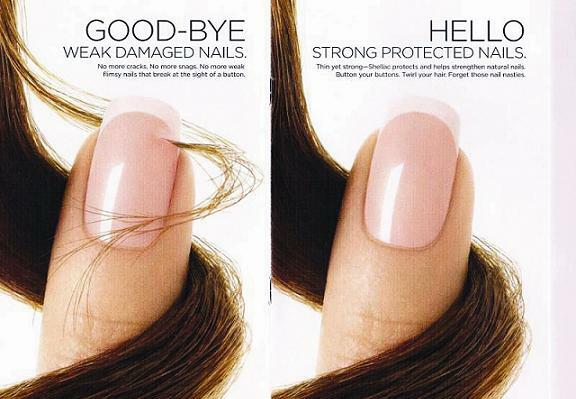 Say hello to Shellac, 14-Day Wear, Zero Dry Time, Mirror Finish and say good bye to chips, nicks and smudges. If long lasting wear and polish-like application don’t draw you in, the removal certainly will. Los Cristianos - 16.12.2010 - "Is this just like another soak-off gel?" Those were my first words at the CND (Creative Nails Design) Stand on the trade beauty exhibition in Madrid, last October. Have you ever worn those colour gel nails that look thick and fake and that have to be removed roughly? I have, and definitely I'm not a fan. Now let me introduce you to Shellac. Shellac truly is a hybrid of traditional nail polish and UV gel polish. Unlike soak-off gels it comes in a polish bottle and unlike traditional polish it cures/dries under a UV lamp. Shellac paints on like polish – base coat, colour, top coat – and is cured in a UV light so there is zero dry time. The colours are hypo-allergenic, and ‘3-Free’– no formaldehyde, toluene or DBP. Shellac was launched in a range of 12 varieties of shades, from pretty French pinks and whites, to siren red and rich darks. The formula is thin and flexible like polish, so it not only looks natural, it provides strong natural nail protection with a resilient mirror finish that resists dullness and chipping, even during the most rigorous activities. Shellac will last 14 days (or even longer! ); however, you will notice a line of demarcation as your natural nails grows away from the cuticle. Fast and safe removal is the big whoop on Shellac: no soaking, drilling or filing. Nails are wrapped in individual Shellac Remover Wraps -integrated cotton pads that limit finger and skin exposure to acetone by keeping it pinpointed on just the nail. Ten minutes of time in exchange for two weeks of perfect colour is all it takes. Say good-bye to manicure frustration and hello to pure manicure satisfaction. Another great thing about Shellac is that there's no dry time. It dries under de UV light in just two minutes. Completely! With this new technique you are going to be able to leave the salon without being worried about taking your keys out of your handbag, having to wash your hair right after your manicure, cook, clean, shop or work. Twist your hair, close your buttons, send hundreds of e-mails, and then look at your nails: you'll be surprised. Isn't this great for the Christmas period? Isn't it great having your nails done just a while before having to go home and get ready for the party without waiting for them to dry? So, whether you have given up nail polish or you love getting a manicure, or you love your own natural strong nails why not give Shellac a try? It definitely will make a difference and your manicure will win a “wow” every time you show it. Produced with news.CMS in 0,0677 seconds.